Happy Labor Day from Family Apron! This holiday marks the last official summer gathering for many, so why not grill some more before Fall comes around!? 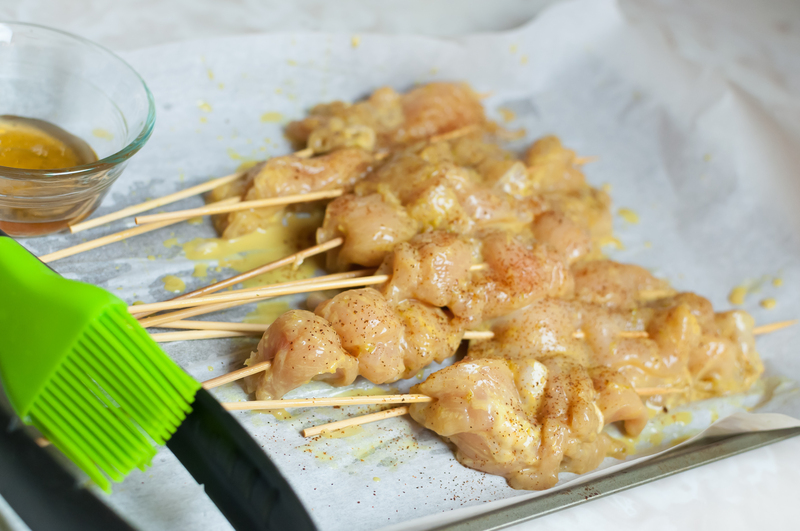 Get together with family and friends this holiday weekend and try this recipe for Glazed Chicken Sate Skewers with Peanut Sauce! The chicken is tastier and more tender the more you let it marinate, so start early! Thank you to the amazing Ellie Krieger for your inspiration on this one! Tip: If you have leftovers, shred or chop chicken and mix with some greens and peanut sauce. This makes a yummy salad or wrap! 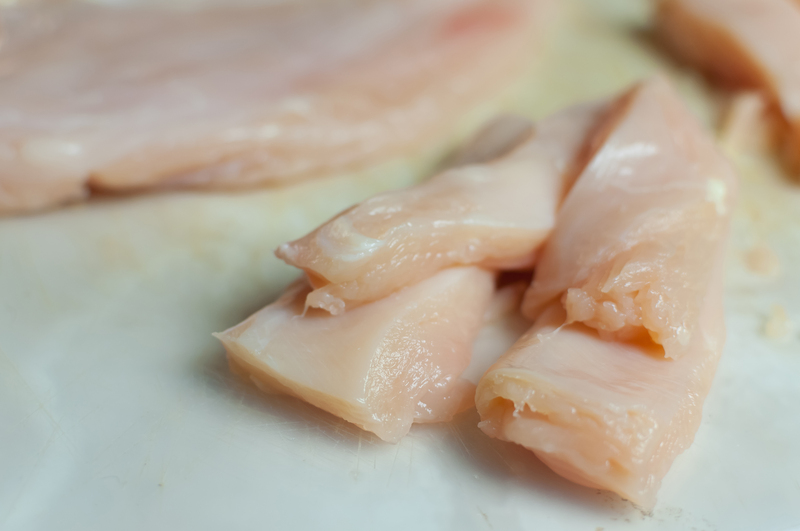 The night before or early in the morning before you cook, pound chicken under wax paper or plastic wrap until only about 1/2 inch thick. Cut into 1 inch wide, 3-4 inches long strips. 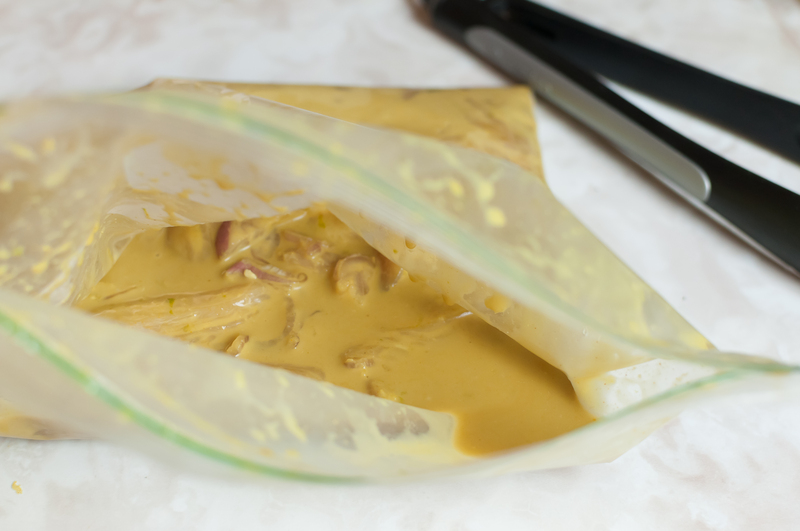 Place chicken strips in a gallon-size freezer bag. Whisk together all ingredients for the marinade from the broth to turmeric. Don’t mix in the honey, paprika and garnishes. 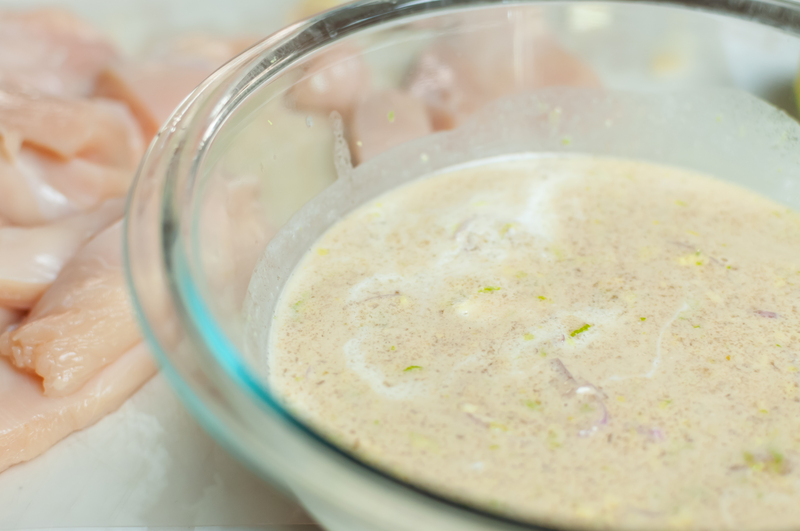 Pour into the freezer bag and massage into the chicken. Lay flat in the fridge and marinate as long as you can, at least 8 hours. Overnight yields even tastier results. 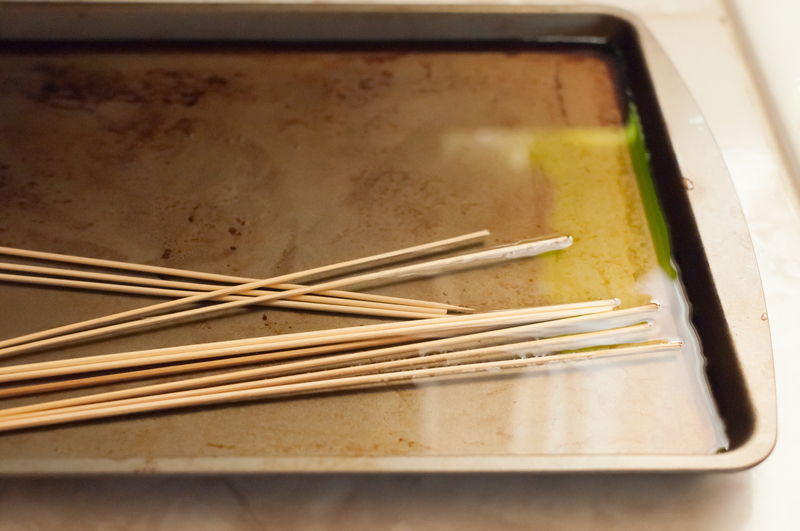 On the day you cook, soak about 12 bamboo skewers in water for 30 minutes. Also, take out the bag of marinated chicken. 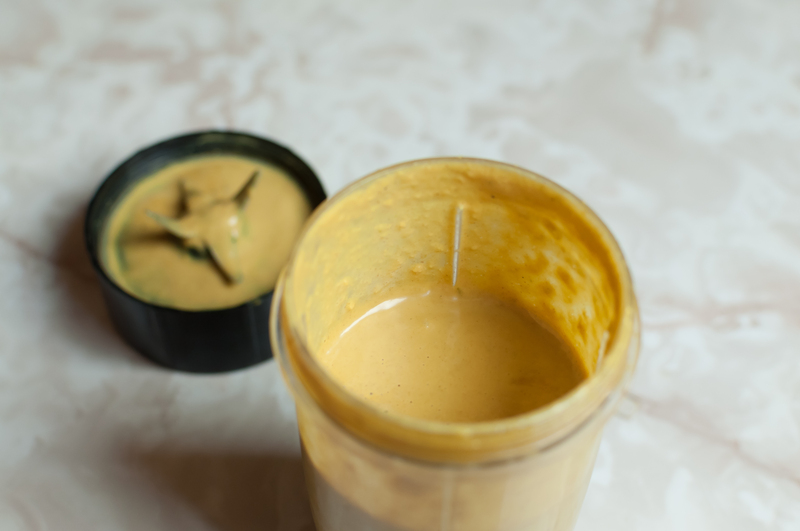 Meanwhile blend together peanut sauce ingredients and set aside in fridge. (If you don’t have a small blender like a Magic Bullet, you can just whisk ingredients if you grate or finely mince the ginger, garlic and shallot.) If too thick, you can add another 1/4 cup of broth. 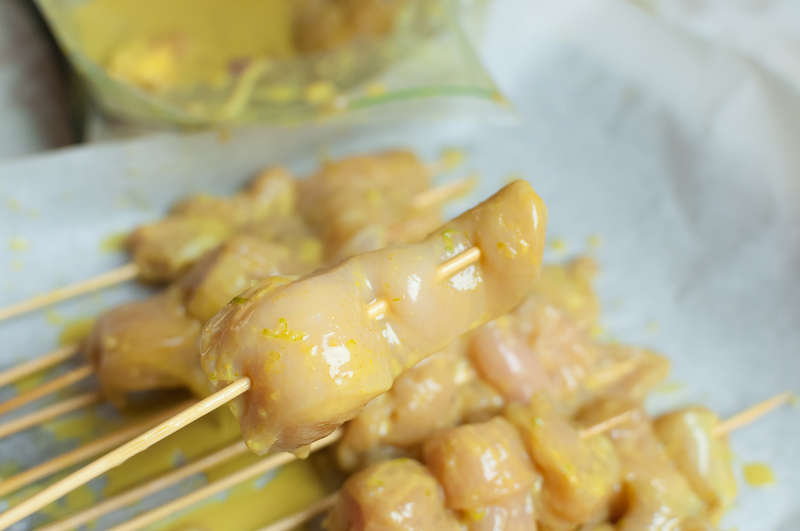 Weave the chicken on the top of each skewer, so that it’s secure and relatively flat and even with meat on each side. You’ll want to make sure as much meat as possible touches the grill. Sprinkle paprika on both sides of chicken. Preheat grill on medium-high heat, until very hot. Spray with cooking spray. 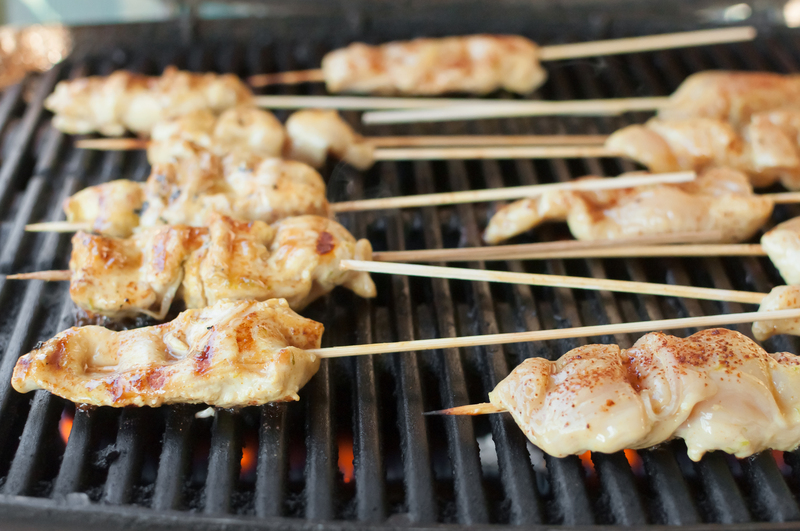 Place chicken skewers on the grill. After about 2 minutes on one side, turn over and generously brush honey over the top. Cook for another 2-3 minutes and let it brown and caramelize. Repeat on the other side. It should take about 4-5 minutes to cook each side of the chicken (About 10 minutes total). 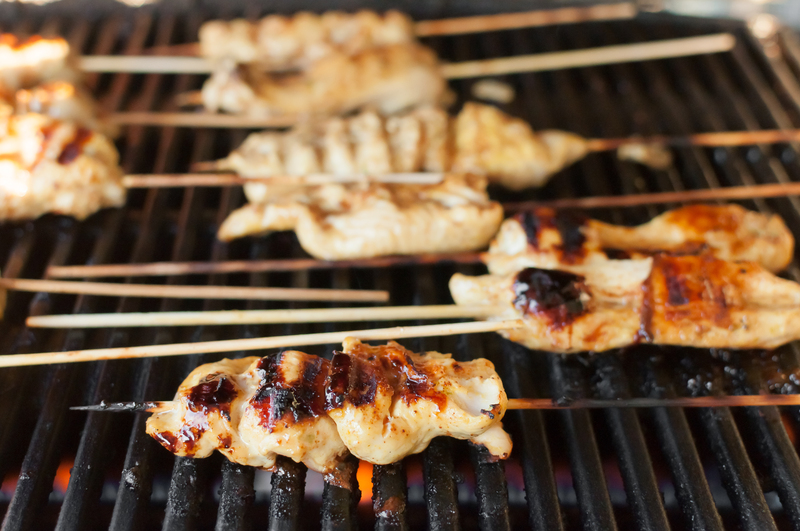 Take chicken skewers off grill and brush more honey if desired. Immediately garnish with toasted peanuts and cilantro so it sticks. Loosely cover with foil. Serve the chicken skewers over some colorful cabbage and pepper garnish, and dip in peanut sauce. Enjoy!